The place, which later became the city of Tacurong was once a barangay of the municipality of Buluan of the then empire province of Cotabato. The place was originally called “Pamasang”, after a creek that flows from south to north of the area. In the 1940s, the place became the way station of the 19-C Survey Team due to is strategic location and suitability for the purposes of the survey team. During those years, the place also became a stopover point for travelers and the Oblate missionaries on their way to the different points of Cotabato Province. The name “Pamasang” was changed to “Talakudong”, the maguindanao term for head covering which was worn by most of the early settlers and people in the area. How the place came to be associated with head covering cannot be ascertained. Eventually, the name was later shortened / changed to Tacurong. 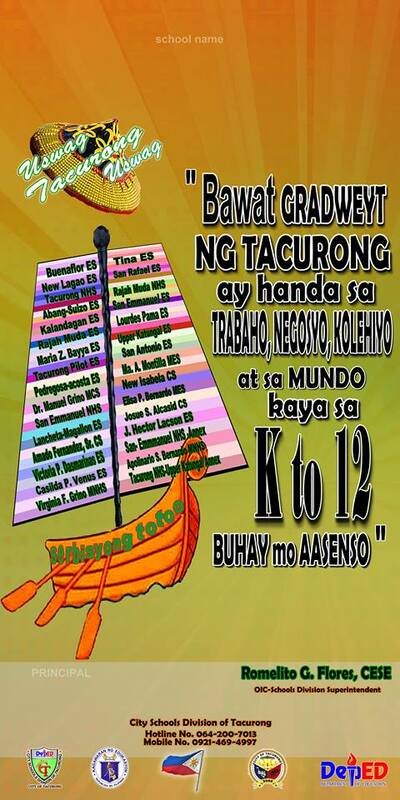 It can only be deduced that the present name Tacurong must have originated from the word “Talakudong”. Tacurong was separated from its mother town of Buluan and was created a municipality by Executive Order Number 462 signed by the late President Elpidio Quirino on August 3, 1951. The city is composed of mostly Ilonggo settlers from the province of Iloilo. Tacurong then had an estimated area of 40,000 hectares comprising 14 barangays. When Tantangan, a barangay of Tacurong was created into a municipality in 1961, the southern portions of Tacurong were separated. The area was further reduced when Pres. Quirino was created into a municipality on Nov. 22, 1973 taking with it some of the eastern portions. Tacurong now has a total land area of 15,340 hectares, the smallest in land area among the 12 municipalities that compose the new province of Sultan Kudarat, created on Nov. 22, 1973 by Presidential Decree No. 341. Although Isulan became the provincial capital, Tacurong remained as the premier town. After 49 years of existence as a municipality, Tacurong became the first component city of the Province of Sultan Kudarat through the effort, of Hon. Angelo O. Montilla, the Congressman of the Lone District of Sultan Kudarat by virtue of House Bill No. 6497 duly approved and signed by His Excellency President Joseph E. Estrada through Republic Act 8805 “An Act Converting the Municipality of Tacurong into a Component City of the Province of Sultan Kudarat to be known as the “City of Tacurong” on August 16, 2000 and duly confirmed by the “Tacurongnons” on a plebiscite held on September 18, 2000. Tacurong is located at the center of Central Mindanao. It is 92 kms. from Gen. Santos City, 96 kms. from Cotabato City and 178 kms. from Davao City. It is situated at the crossroads of the Davao-Gen. Santos-Cotabato highways, and is the population, financial, commercial, education, and rest and recreation center of the area. It services the needs of 15 neighboring municipalities. People from these areas go to Tacurong to sell their products, purchase their needs, pursue education, avail of medical and health services, and seek recreation. As an important hub of the Mindanao transport grid, Tacurong is visited by numerous passengers and transients on their way to the cities of Davao, Cotabato, Gen. Santos and even Cagayan De Oro.